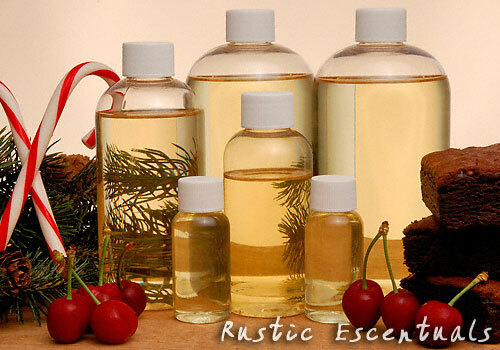 Mix conditioner & hot water well, until conditioner is dissolved completely. Put about 2 tbsp. in the fabric softener holder in your washer… then wash as usual. (Some people use downy laundry balls. I don’t have one and I have a slot for fabric softener in my washer, so that’s what I use. I also have an HE washer and this is fine for it. How To Wash Your Clothes In A Down-Grid World | Survivalist Daily. ” Last week I read an article that highlighted a study done on dryer emissions. 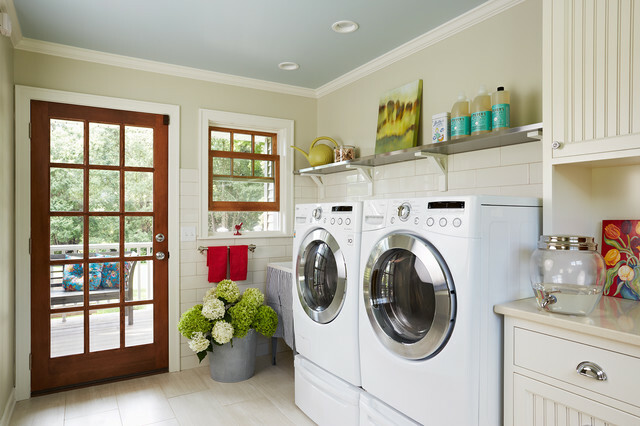 The study conducted tested air from dryer vents used to dry clothes that had been washed with brand name laundry detergent, rinsed with brand name softener and dried using brand name dryer sheets. The air collected was tested and found to contain many toxic chemicals, two of which were carcinogenic: Acetaldehyde (which when studied was found to be damaging to DNA and caused nasal tumors in rats and laryngeal tumors in hamsters) and Benzene (which according to www.cancer.org, has been linked to acute lymphocytic leukemia in children and to chronic lymphocytic leukemia in adults). In our house we are already trying to be as green as possible so this was rather alarming, especially when you consider how many households use dryers and how frequently. 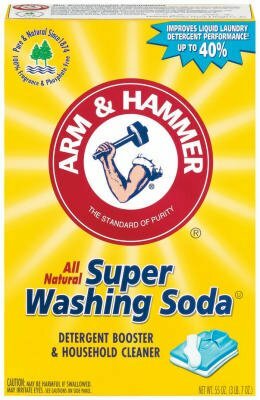 We stopped buying laundry soap last year, I have been making our own using a very basic recipe but the soap works wonderfully! We quit using fabric softener years ago, following the birth of my youngest and her extreme infant sensitivities. 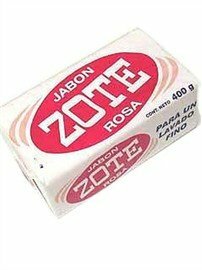 We had however, still been using dryer sheets! 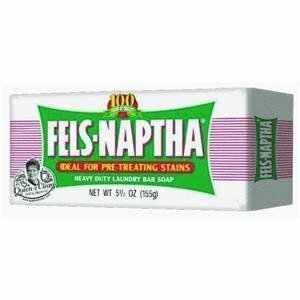 I had already been trying to find a green alternative to the dryer sheets as I see the spent sheets as such a needless waste. 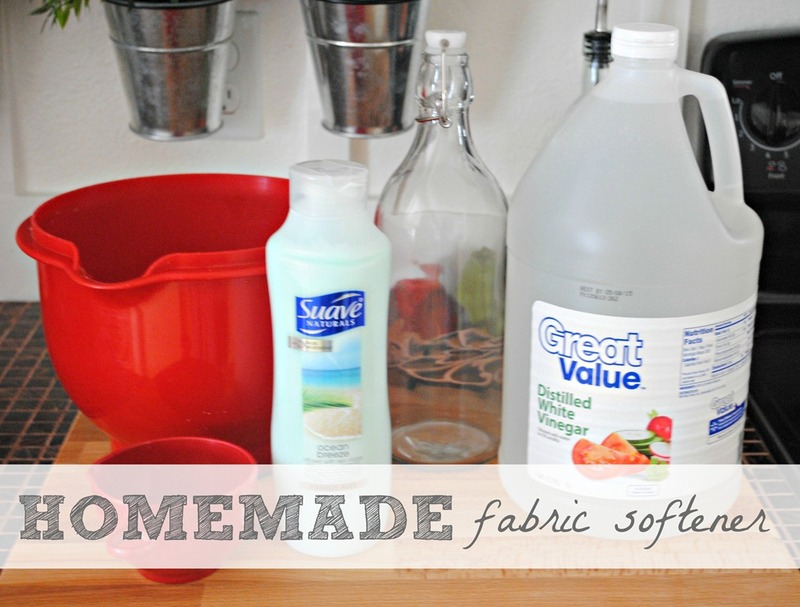 I had been considering making my own reusable sheets using cotton wash rags, vinegar, water and fabric softener…and then I read the study! 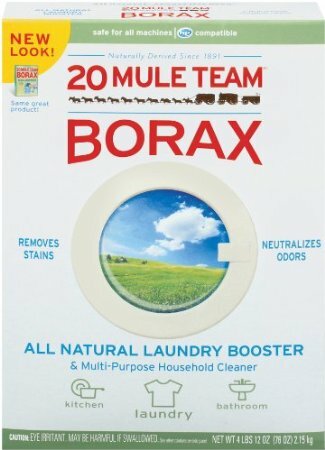 I started drying the clothes without using anything but my husband and kids complained about the static so I started on a quest to find a solution to our drying needs. Almost right on cue there was a new post on the Home Farm Ideas Facebook page, the thread was started by Alexis K. and was about soap-making. From soap-making we somehow started talking about laundry soap alternatives such as soap nuts and then I was introduced the concept of felted wool dryer balls. I started talking to some of my friends about it and lo’ and behold they were proud owners of wool dryer balls and they started telling me how well they worked…I was now determined to make some of my own! On the same Facebook thread, Suzanne B. posted a link on a tutorial! Amazing! I had the know-how, I had the will…I just needed some wool roving, batting or yarn. I decided on some yarn as I couldn’t find any local store that carried batting or roving. 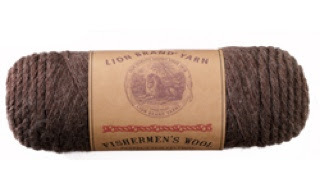 The next morning I hit up my local Michael’s craft store, armed with a coupon for 40% off…I got three skeins of Lion’s Brand Fisherman’s wool yarn. I wasn’t so sure how the colors would interact with my clothes in the dryer so I took the safe route, I bought one cream, one brown and the third was a combination of both. I also got a hold of a pair of nylon knee highs, ok…I must admit it, I had to go out and buy them, but hey…I got TWO pairs for 82 cents!!! I came home and set about to making two equal sized yarn balls out of each skein. (My dear husband thought I was having too much fun doing this so he volunteered to help me wind up the yarn, hehe). Three skeins of yarn then became 6 balls of yarn. I made sure to tie the ends into the ball in order to secure it properly. I didn’t cut off the ends, I just stuck them deep into the ball (zero waste there!). I then took the nylon stockings and turned them inside out, the reason for that was because the toe-section of the nylons each have a massive seam and it would have left an indentation in the wool balls during the felting process. I then took the first ball, put it all the way into the nylon stocking, and then tied a knot. I took the second ball, put in the same stocking, and tied another knot. Repeated with third ball and then ran out of space in that nylon so I secured that end and put that wool/nylon sausage aside (hehe…well, that’s what it looked like). 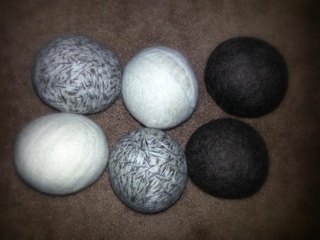 I repeated the process with the other nylon and the remaining three wool balls. I took both wool/nylon “sausage links” and placed them in a pillowcase and tied the pillowcase shut. I ran a HEAVY DUTY (fastest agitation) cycle in my washer using HOT water (small load), using my homemade laundry detergent and placed the pillowcase in, along with other clothes. I left the top open (we haven’t transitioned to a front loader machine yet) so it would not drain the water and as soon as the agitation stopped we reset it to the beginning. We did that until the water went tepid and then we let it drain but refilled it with HOT water again, ran another heavy duty cycle (without laundry soap this time), left the top open again so we could reset using same water, and after reset we closed the lid and let it finish off. 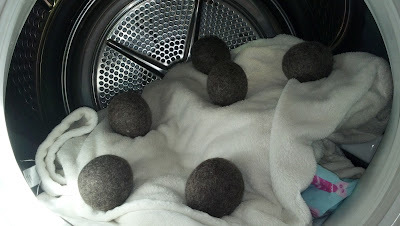 I then opened the pillowcase to check in on the wool balls and was happy to see that they had felted! (From all that I have read you need HOT water and agitation to properly felt wool). As you can tell from the picture, the brown ones are so felted you cannot even tell where the thread lines were. The other four are still properly felted but the thread lines remain. The wool balls were now smaller than when they initially went into the wash and I assume that is just a product of compacting during the felting process. If you decide to make your own wool dryer balls, if they are not properly felted at this point, run them in another hot water wash, if they are felted then just throw them in the dryer with a load of laundry and put them to work immediately. I initially tested these dryer balls with three heavy blankets; I used to have to set these blankets in for 60 minutes, I now set them at 40 minutes after which they came out completely dry! Could it be that in the process of finding a dryer sheet alternative I found an energy efficient one as well? I then ran a large load of laundry and dried those as well BUT I was unable to run that for less time and get the same result…however, I believe I may have overloaded the dryer that time. I ran another load of laundry, this time I added a couple drops of eucalyptus essential oil to one of the wool balls, once again I was able to set it for 40 minutes but this time the clothes came out smelling AMAZING! Best of all, ALL the clothes (ok, with the exception of the wool blanket) were static free! My husband is convinced, my children are happy, our emissions will be greener, our wool dryer balls are reusable (should last for years), our clothes are static free, wrinkle free, softer and best of all our electric bill will be lower!